ASINITAS Onlus is a not-for-profit organization founded in 2005. It is active in the field of education and social work. Its mission is to promote the care, education, training, sheltering and testimony of Italian and foreign adults and minors. Its primary work focuses on promoting processes of inclusion for subjects perceived by society as non-equals, in order to bolster their social presence. Active education, person-centered care, story-telling, and gathering of biographies and testimony are the privileged methodologies. 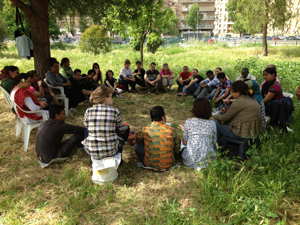 As an interdisciplinary working group it focuses on second language acquisition research with students who have a low level of literacy in their L1 by adapting several methods, from M. Montessori to Freinet, to the Italian experience of active learning with Cemea and the Movement for cooperative learning. The organization coordinates two schools of Italian as second language for foreign women and mothers, refugees and asylum seekers, and migrants In Rome. The schools also include workshops on manual expression; listening spaces for Italian and foreign women and families; theatre workshops; orientation on health services, culture, education and training; training courses for teachers, educators, socio-cultural operators. The association promotes community participation through different activities and social labs in cooperation with local institutions, local NGOs and population to raise awareness on the issue of international migration and inter-cultural exchange.